Remember Popslate, the startup which took two and a half years to deliver a case that added a secondary E-ink screen to your iPhone? They're back again today with a new Indiegogo campaign for a new case, and once again Popslate is making huge promises which they may or may not be able to deliver. Slashgear and The Verge have reported that Popslate is showing off the Popslate 2. 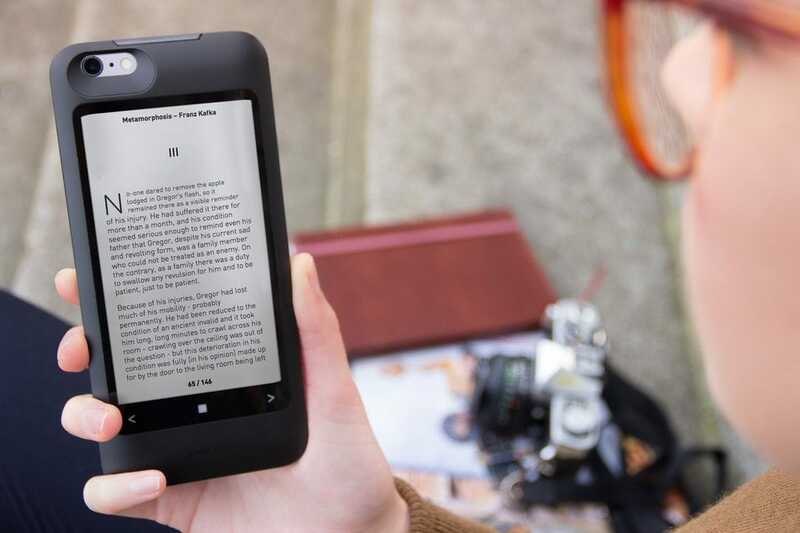 Neither site has put their hands on a functioning model, but Slashgear did say that the non-functioning prototypes they saw feature a larger E-ink screen which is packed into a redesigned, thinner case that doubles both as a secondary screen and as a backup battery. According to Popslate, this case has a 4.7" E-ink screen (800 x 450 resolution) and a battery that adds 9 hours of run time to the iPhone. It has a pass-through lightning connector that lets you charge both the phone and the case, three buttons below the screen for input, and a cut out for the iPhone's camera and flash. There's no word on what it can actually do (I'm still searching for a user report), but Popslate is pitching the new case as an ereader, a static display for digital tickets, or as a notification center for apps. It's supposed to be able to run up to five different apps simultaneously which you can switch be pressing the center button on the case (I'm still waiting for confirmation). But right now I can confirm that the dummy unit for the new case is significantly thinner than original Popslate case. The deal-breaker for me, though, was the fact that, though popSlate had its own battery, it didn't share any of that power with the iPhone. Considering I often have to turn to an external battery-case to keep me going until the end of the day, it came down to a choice between the aesthetic and functional advantages of the e-paper case or simply being able to use my phone at all, and unsurprisingly the latter won out. The Popslate 2 case is up for pre-order today on Indiegogo. You can order one for $69, or a pair for $136, and supports all four iPhone 6 models. It is scheduled to ship in July 2016.